My class with Kathy Fenchel was this weekend. The above design is my progress from just class time. Alot of metallics and application in this piece. The left glove is felt and the silver soon to be a tube of lipstick on the right is kid leather. The center glove, when finished will have a bullion rose with detached leaves. I have to go dig out some of my stumpwork supplies for that one. She does her stumpwork with a different technique than I was taught and I'm not so excited about. After my class I was tired of looking at my new piece after staring at it for 8 hours so I decided to work on the assembly of my Shaker Sewing Box. Another guild member had it almost together at sit and stitch on Thursday and showed me how it worked so I decided to give it a try myself this weekend and I've made some great progress. 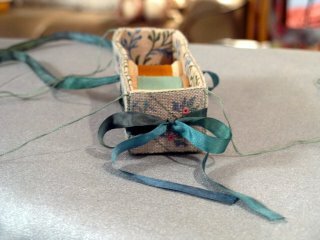 I don't have the buttons it called for so I wasn't able to finish the ribbon nor am I quite sure how I want to tie off the threads that hold the sides of the box together so those things will have to wait for Thursday so I can ask her about it. I've included a ruler here just to show you how small this piece is. 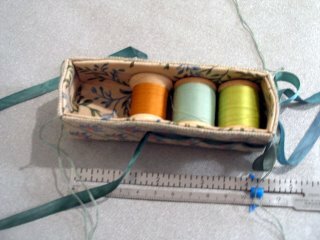 When I first saw it in Sampler and Antique Needlework I thought these were the larger spools and this was a much larger piece. The first time I saw the outline I was surprised but it is coming out nice. On the down side of all this progress mom has decided that I should put hers together as well. She HATES assembly, she has no patience to mess with the smaller pieces yet she keeps starting projects that she knows will require assembly but she does them anyway. *sigh* maybe I should try to talk her into sending it to the finisher instead hee hee. Looking forward to seeing a picture of it all done. P S you are right -- it does look kinda small compared to what I had in mind! 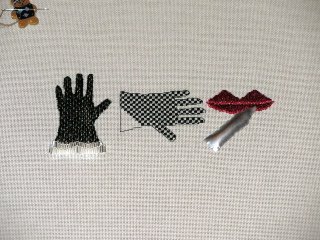 The gloves and lipstick project is very unusual, but looks great! Kim both projects are wonderful. I love the gloves and look forward to watching this grow. I really like the diffent textures. Your class piece is very different! How exciting to try some new techniques!